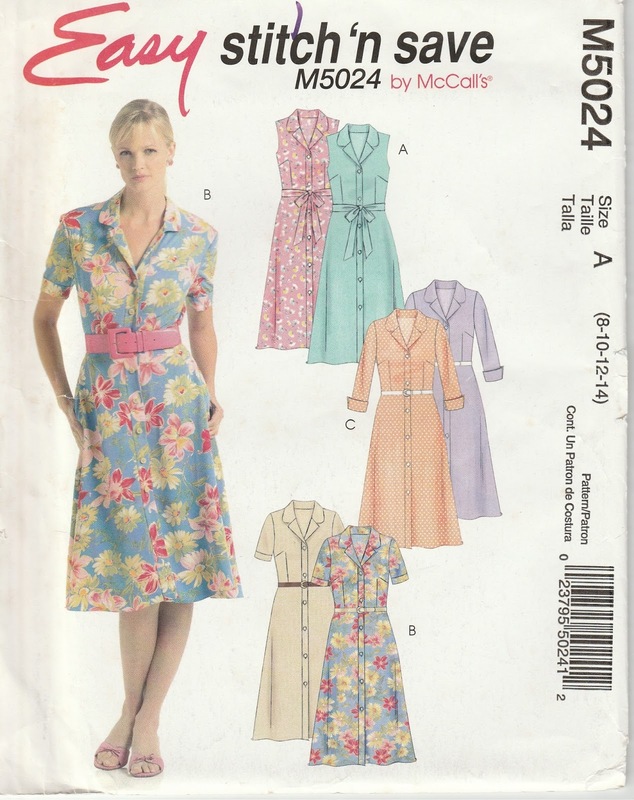 There are an awful lot of very nice new shirt dress patterns out there, but this one has been sitting in the pattern drawer for quite a few years, and I thought that it just might be time for it to see the light of day. It hung around the sewing room for a few weeks minus buttonholes and buttons, and I needed an “occasion” to get it finished and worn. So I decided that Sunday’s lunch at church (which means that I spend hours in the kitchen) was the occasion. I got up early and managed to finish it all up in plenty of time to wear. As should have been expected, in fairly short order my skirt was sporting olive oil stains. Oh well. I’m good at laundry. Pictures taken, I went off to change, and only after I had taken off the dress, did I realize just how much heat that fabric retained. The weather wasn’t as hot and humid as I’d thought – it was the dress that made me feel that way. And then I noticed the back … See what happened to the back darts? The fabric pulled away from the stitching. I’m a little upset. The fit is not tight. I should be able to lift and move and do whatever I need to do in a dress of this sort without worrying that I’ll ruin it. Especially when the fabric is supposedly 100% cotton. Does anyone have any brilliant ideas of how to fix this problem? I’ll still wear the dress at home (though not when the weather is hot and humid). The ¾ sleeves do not exactly make it cardigan-friendly, so I can’t always cover up the back. May-be I just have to take note and only wear knits to the church kitchen?? The insides show my latest bit of craziness. I seem to have acquired a collection of serger threads in colours that I normally do not sew. I reasoned that if I can use crazy fabrics to make Hong Kong finishes on the insides of garments, then I can use any colour thread to serge my seams. There are red spots on the fabric, so why not red thread on the insides?? I’m not the only one who’s recently used this OOP pattern – check out the lovely version on Frogs in a Bucket. 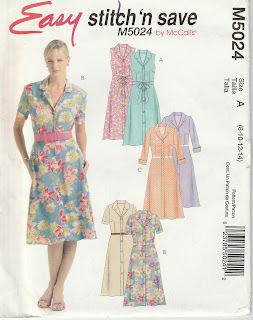 I saw this blog post once my dress was well under way. I swear this time I am not being a copycat. 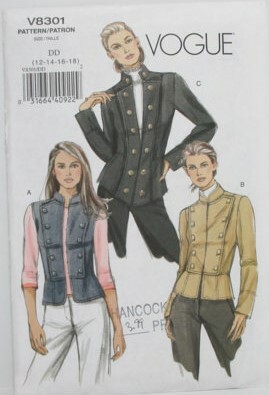 I must have bought the pattern soon after it came out. Periodically I would look at it, then put it away. I was waiting for the perfect piece of wool. I was waiting for the perfect event for which to sew this jacket. Didn’t happen. Now why didn’t I think of using denim?? So, yes, I had the pattern. The denim that I had on hand was leftovers from a Minoru jacket (did I blog about that?) and leftovers of the exact same denim that I used for a pair of jeans. Pieces. As luck would have it, this jacket has a lot of pieces, and with some careful laying out, I managed all the important ones in denim. Facings had to be cut from a cotton print. But that turned out well, too. I had bought the piece for a summer top – nice neutral print in grey, with the hopes that laundering would soften it up some. It didn’t soften at all, and I was kicking myself for being stupid enough to think that all that stiffness of the fabric was sizing. As facing pieces on a denim jacket it worked perfectly. Win, win. The buttons came from stash. One of those “Love those gotta have those” purchases. I must have been thinking of this particular jacket at the time. As it turned out, I had more buttons than the pattern called for, and the size was a tad smaller than required. What the heck – let’s put all of them on the jacket and not leave any leftovers. Yes, there are buttonholes under all those buttons, and hooks and eyes for closing the front. I did not put in the shoulder pads as directed. I LOVE this jacket! Over the years (decades?) I’ve made a few “regulation” jean jackets. I hardly ever wore them. Just not “me”. I’d try again a few years later with the same results. (Took me a while to figure out that there was no need to keep trying out slight variations of the same thing. The result would always be the same.) A denim jacket, on the other hand, is something that my wardrobe could always use. It works with so many bottoms, and even some dresses. Soooooo…. Thank-you Erica for putting me on to such a great jacket! even had enough grey print for the insides of the jeans - now is that a matching set or what! P.S. I actually sewed both of these in March/ early April, but pictures only happened yesterday. Apologies for the wrinkles, but these items have been worn, and I was rushing to get some pictures while rain wasn’t coming down. I had shirts on the brain for a while, and I thought to try out the Granville from Sewaholic. Lately I am of the opinion that one really needs two shirt patterns to fall back on: one that is well fitted for use with sturdier and crisper fabrics, as well as a looser fitting pattern for softer fabrics. (That’s my thinking to-day. Tomorrow I might be of a totally different opinion.) The Granville definitely falls into the “well fitted” category. The pattern had been lying around here for some time, and in January I finally decided to start a muslin (in muslin, of course). Once class samples were ensconced in the store, it was back to tweaking the pattern. First and foremost – the sleeves were far too long. I’d already sewn the vent and cuff on the muslin (I did intend for it to be a wearable piece), so the only option for shortening was to do it from the top. Secondly, there was too much sticking out at the hip (the Jetson’s look, my daughter calls it – if you recall how clothes look on Mrs. Jetson in the cartoon by that name). That was an easy fix. Thirdly, there was some weird “pouf” across the front. I seem to have no problem slashing and mangling other people’s patterns to get them a good fit, but when it comes to my own … I decided to be brave and do what my gut instinct (and all sorts of fitting books and instructions tell me) – I took an inch out of the centre of the front piece. The bust dart disappears. (Yeah! No darts to sew!) And … problem solved – no more weird pouf. So, that makes two shirts with darts that are perfectly wearable, just not so perfectly fitted. Onward. A new shipment of fabric at Joyce’s brought a Japanese calligraphy print. Don’t know why, but I just had to have it. For a shirt. I added some coordinating black print to take this out of the boring zone. By this point, I was also looking at tweaking other bits on this pattern, so I squared off the collar. So much easier to turn a perfect point when it’s a 45° angle! And I didn’t add the sewn-on front band. I widened the sleeve at the bottom, which added a few pleats so that it would fit into the cuff. I just happen to like my shirt sleeves a tad wider than what the pattern gives me. Finally I decided to use a white with black dot mystery fabric, more for the sake of finally using up the fabric, than actually needing yet another shirt. This one got front bands on both front pieces. And heaven forbid that this one should be plain and boring, hence the black piping. After 4 shirts in under 3 months (I finished the 4th in March, I believe), I’m quite over shirts with collar bands for the time being. I’m still not 100% happy with my tweaks. The cuffs are a bit large for my wrists. I was focusing on other issues, and quite overlooked that fact until I actually started wearing the shirts. Something to deal with the next time I use this pattern.